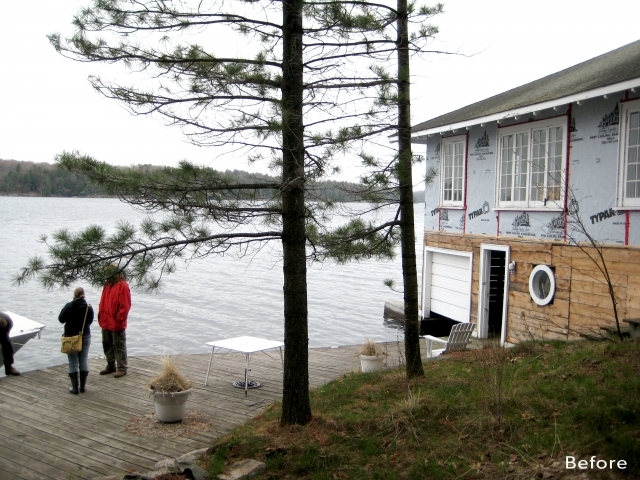 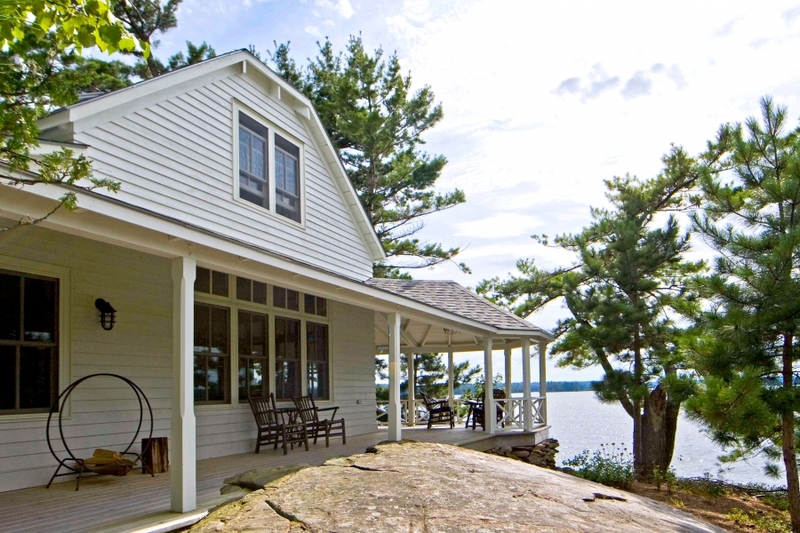 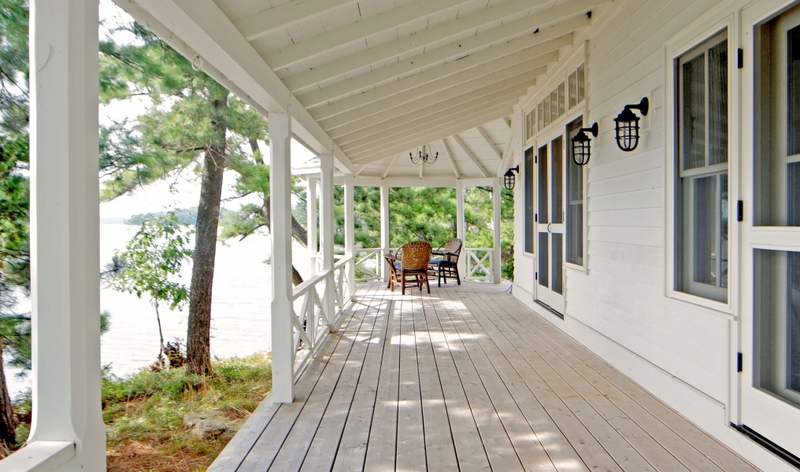 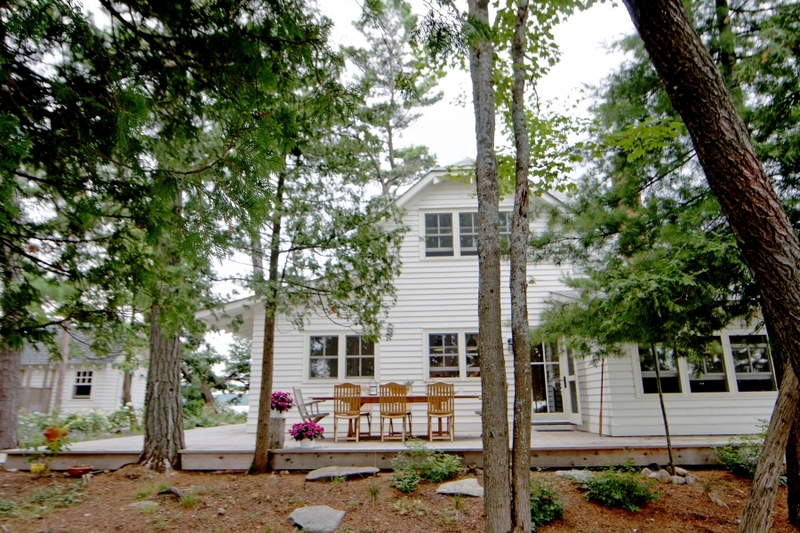 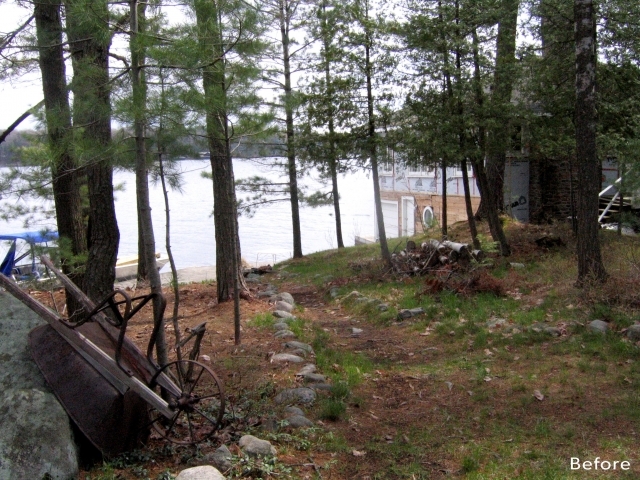 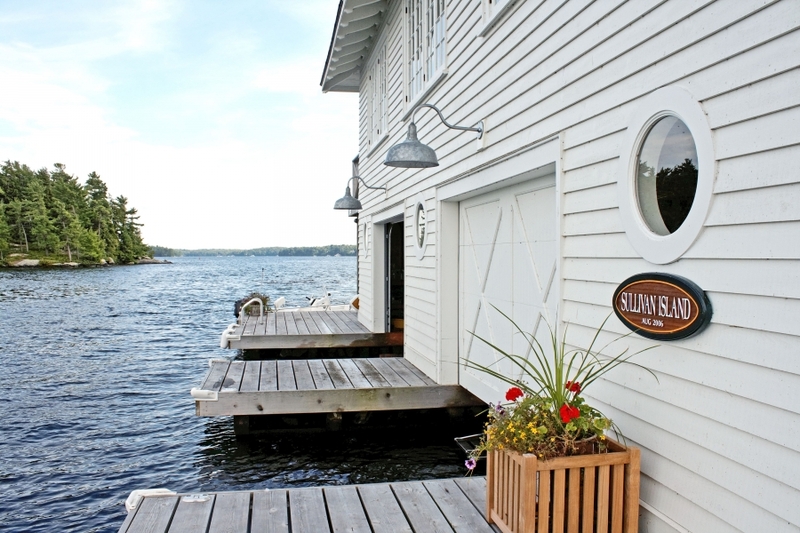 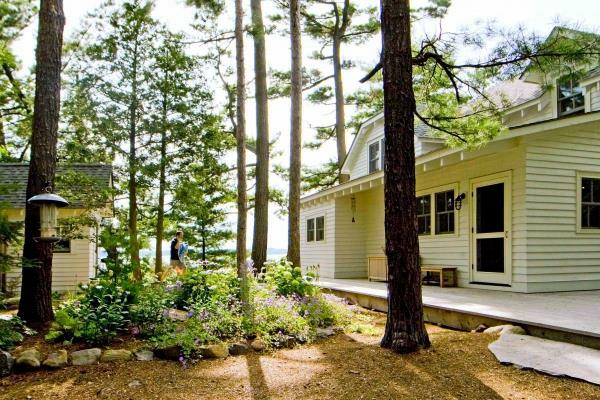 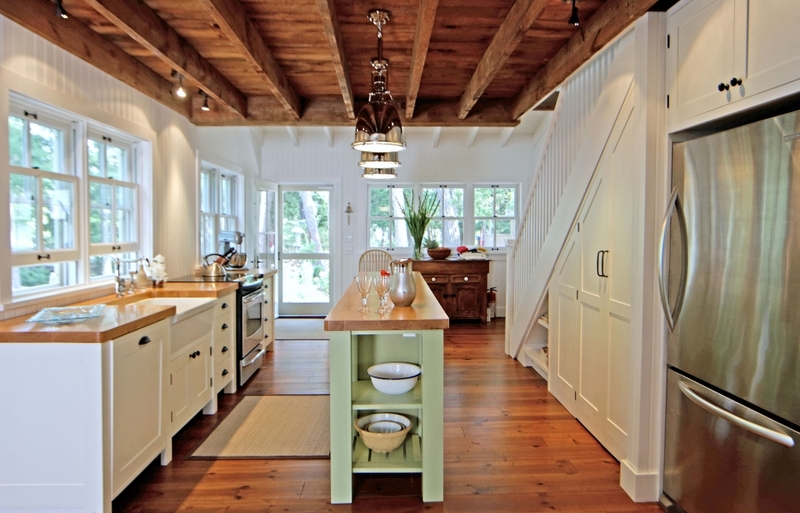 This centuries-old Muskoka island cottage was transformed into an energy efficient building through this historic restoration project built by Tamarac North. 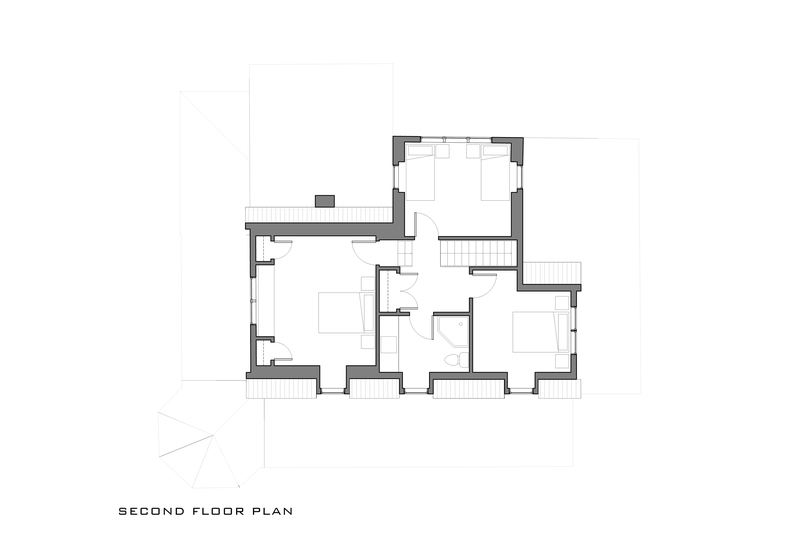 The existing structure was reused and reconfigured to improve and expand interior spaces. 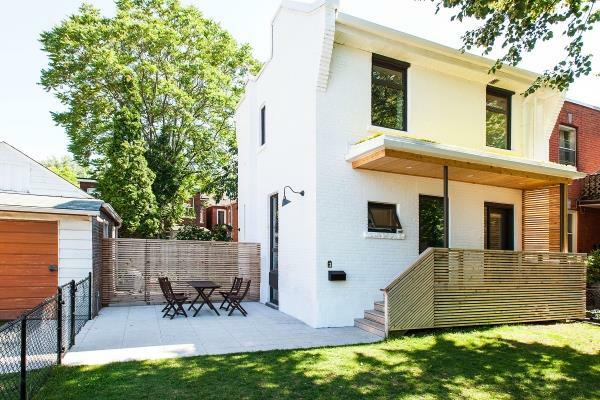 The renovation was a complex, full-gut job, an undertaking that’s often more difficult and comparable in price to a new build. 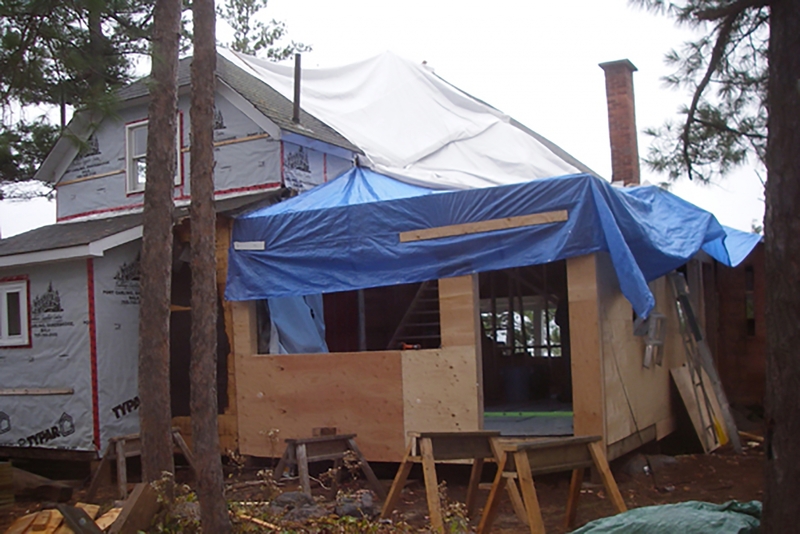 In this case, the interiors were fully removed, including the finishes, windows, electrical and plumbing systems; the existing structure was repaired; and new insulation, windows, and building systems were installed. This was a full-gut renovation of the existing cottage structure, because new bylaws put in place after the home’s original construction made it impossible to build a new structure in the same location. 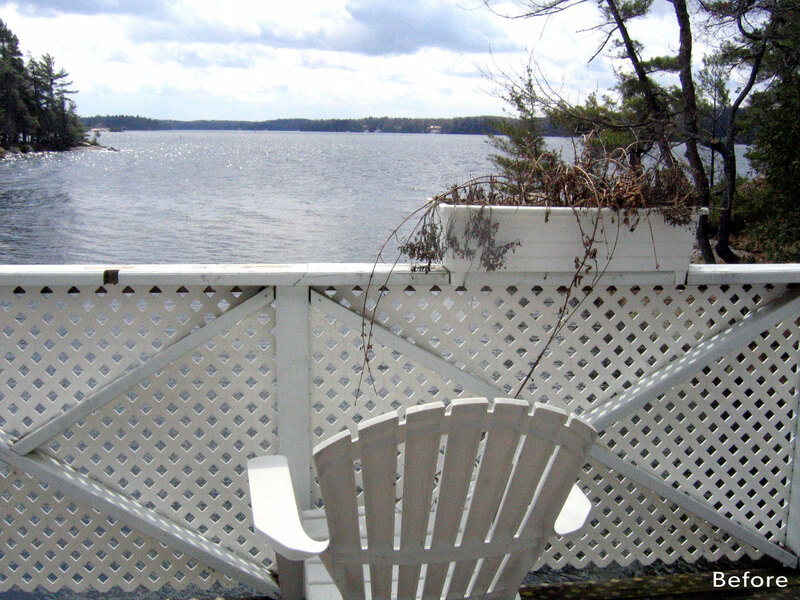 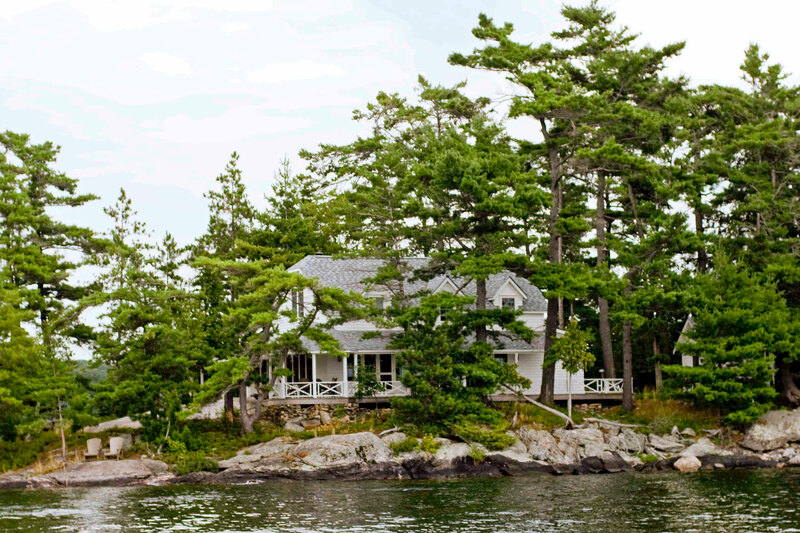 The house sits on a small island that is less than an acre in size, and it is very close to the shore – as close as 10 ft. in some places. 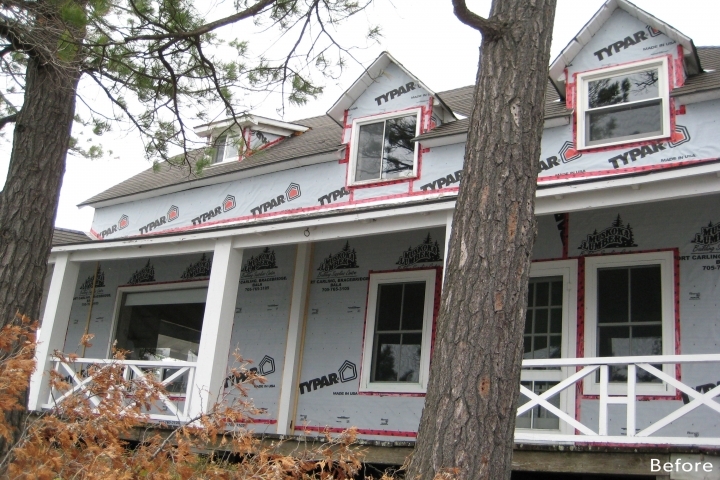 The new regulations state that a new-construction home on the island would only be allowed to cover 10 percent of the island’s area and be built 66 ft. from the shore. 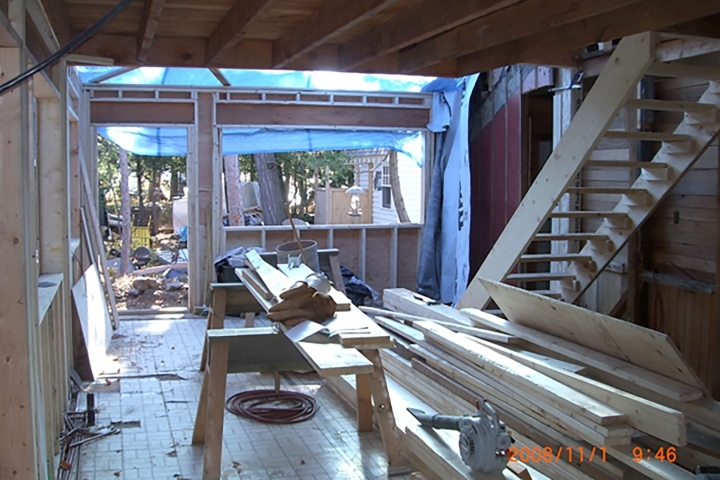 Renovating allowed us to work within the footage of the existing building, while still complying with building regulations. 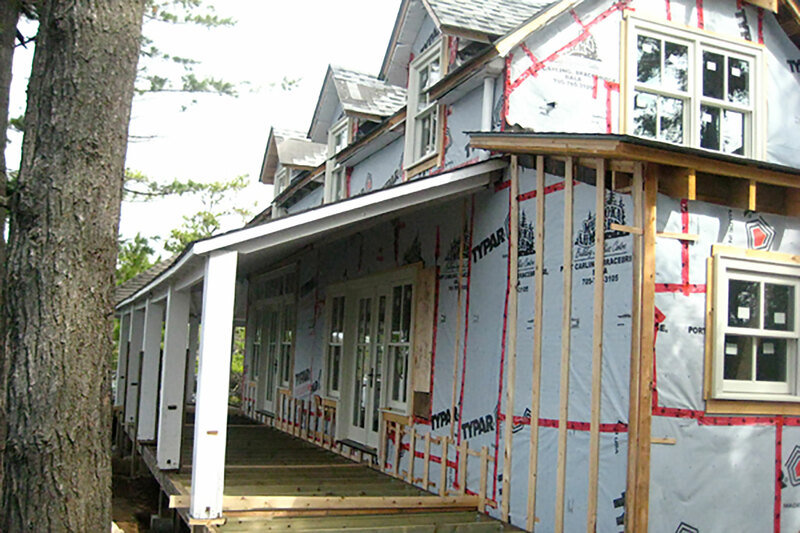 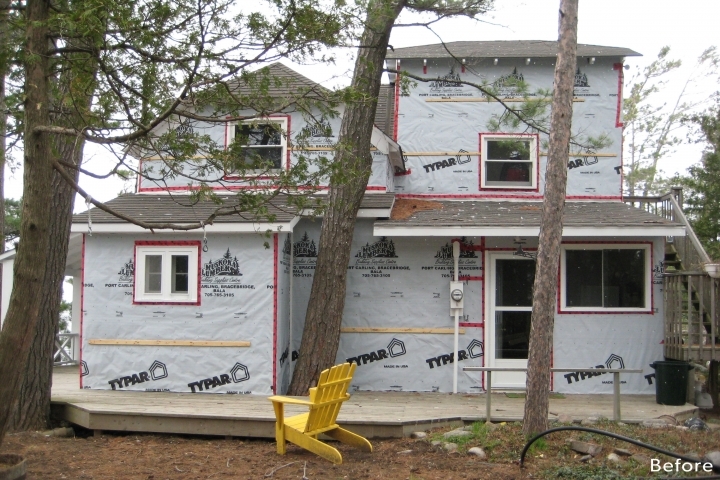 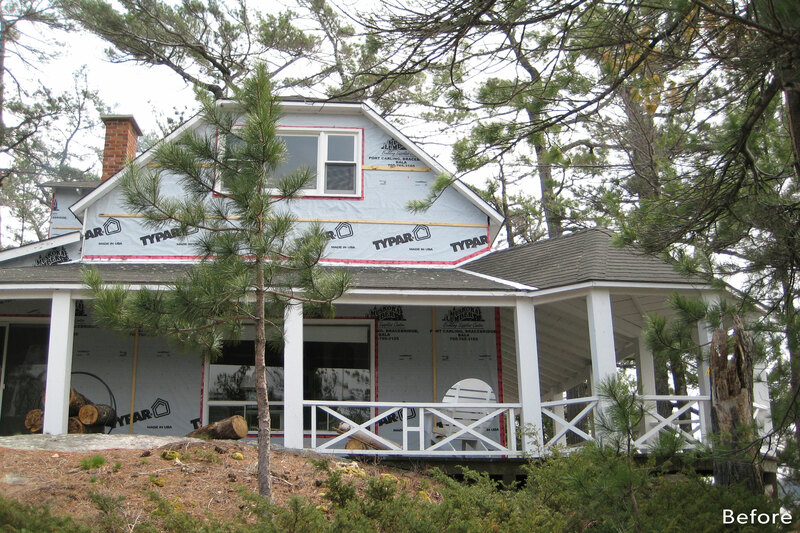 Spray-in-place polyurethane insulation was used between existing studs to seal and insulate the building envelope and extend the seasonal use of the cottage. Original features, such as wood beams, were exposed and celebrated, leaving the classic character of the cottage renewed and restored. 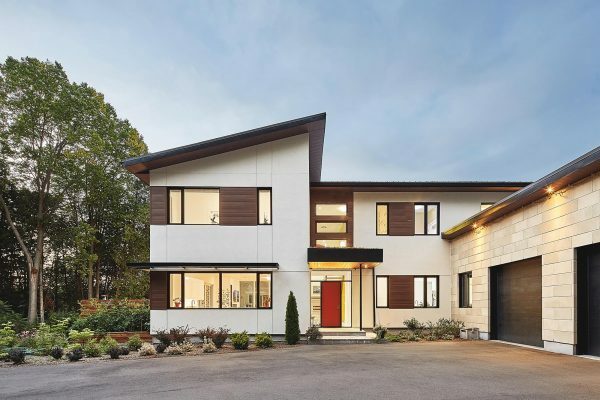 Given the zoning restrictions, we knew that we could not add to or significantly change the footprint of the building, which made for an interesting design challenge to fit all of our clients’ needs within the envelope of the existing building. 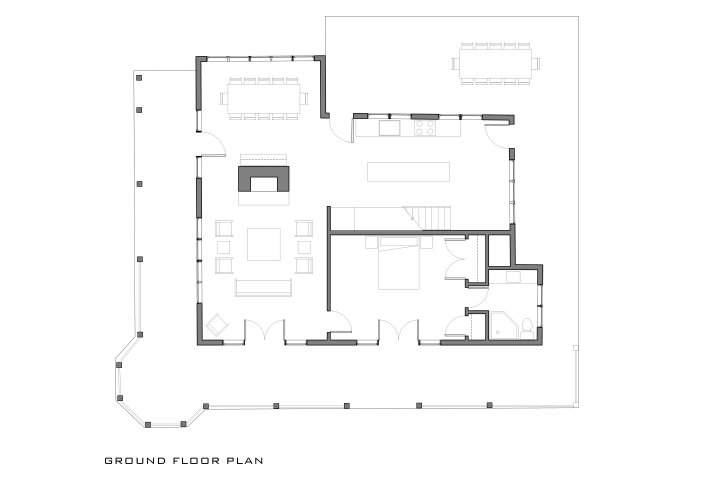 As a result, our design strategy was more of a collection of small surgical changes, rather than sweeping gestures. 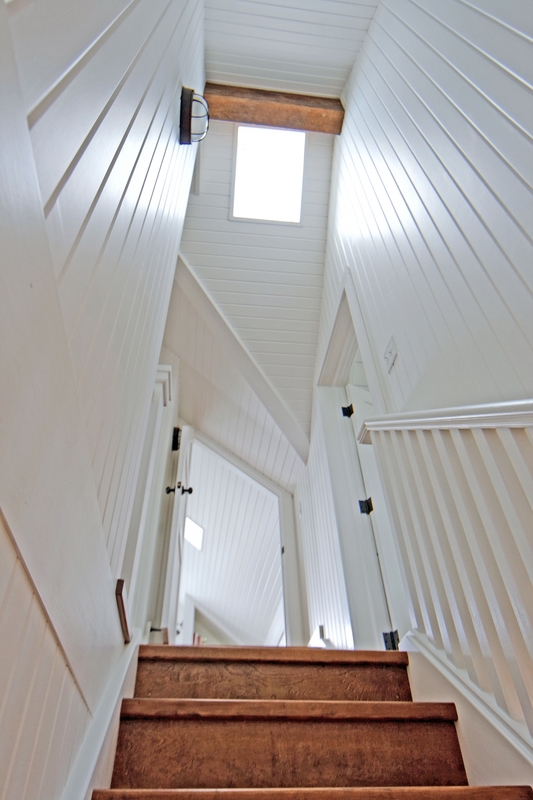 On the ground floor, an interior stair was installed using a natural gap in the structure which was exactly the right size for a staircase. 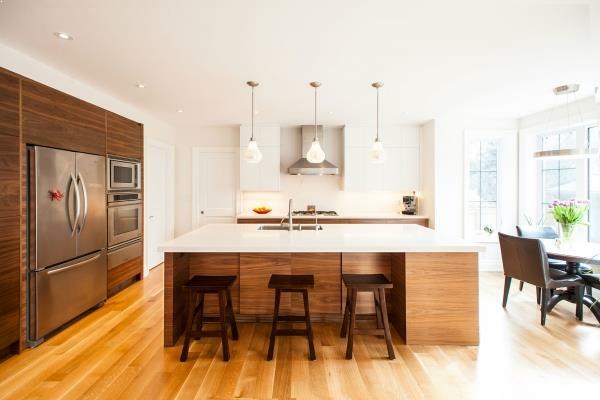 The kitchen, dining room and living room were connected by removing several small walls, resulting in a large open-concept ground floor with graceful circulation. 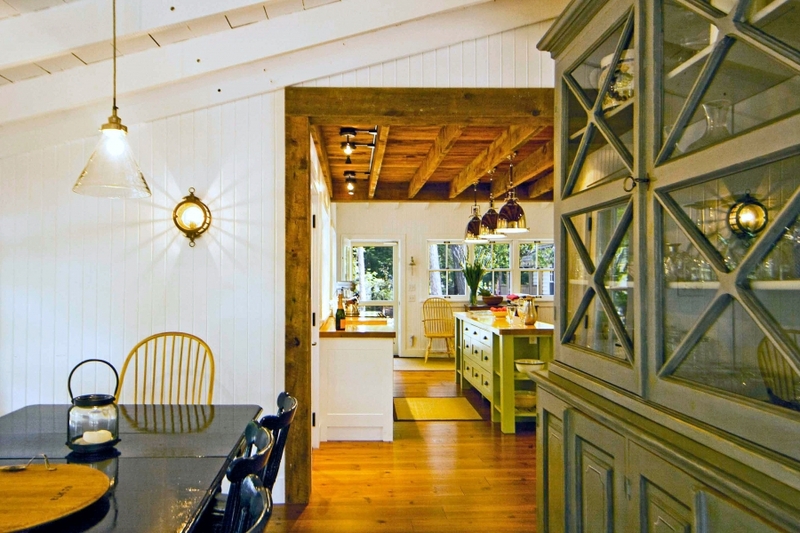 Three doors open onto a large wrap-around veranda that embraces three sides of the home. A master suite with an ensuite bathroom was also added to the ground floor and given its own private door to the veranda. On the second floor, the design incorporates three bedrooms and a bathroom. 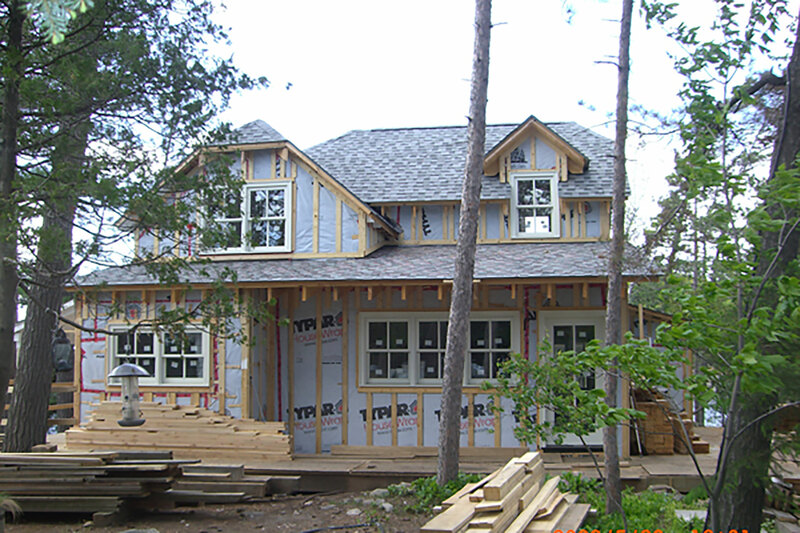 The roofs were unified by adding a gable roof onto the tower and adding matching new dormers. 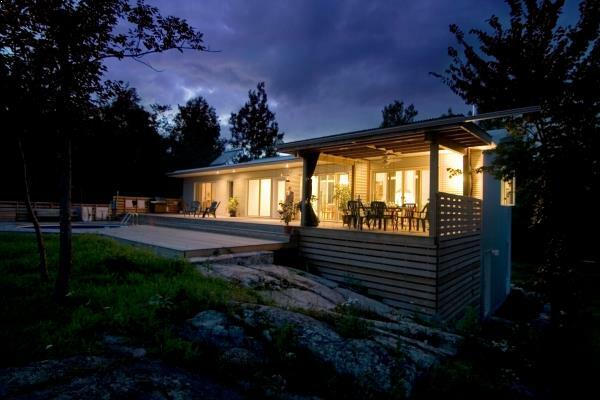 Additionally, the previous building’s low roofs were raised to create more space below and to simplify their appearances. 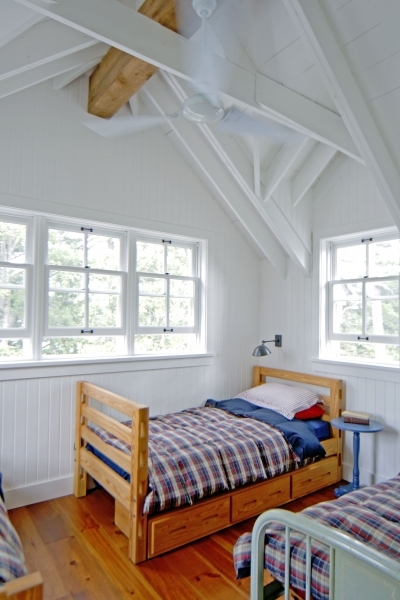 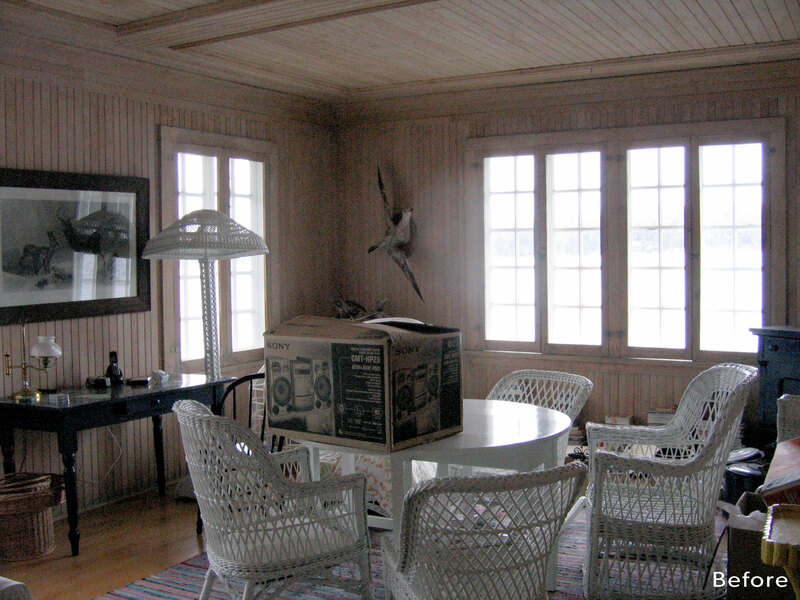 Throughout the house we installed new, custom wood windows designed with a traditional aesthetic. 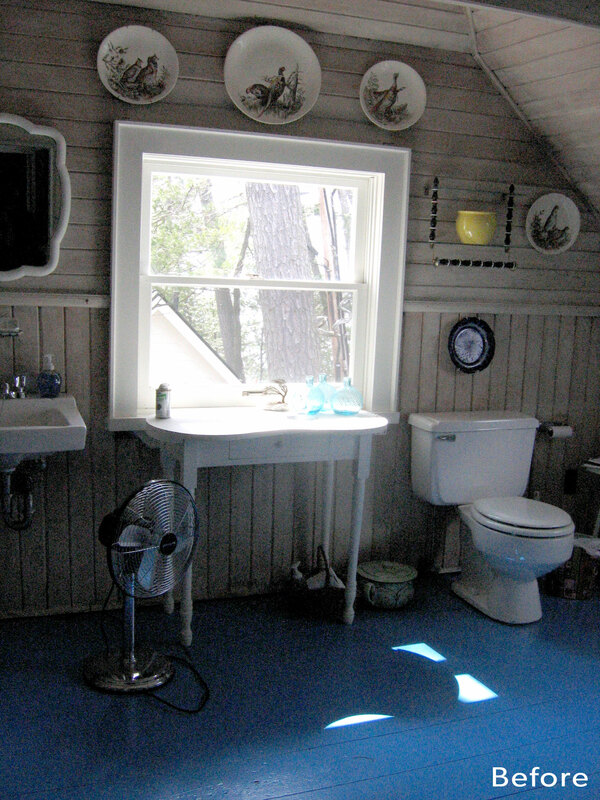 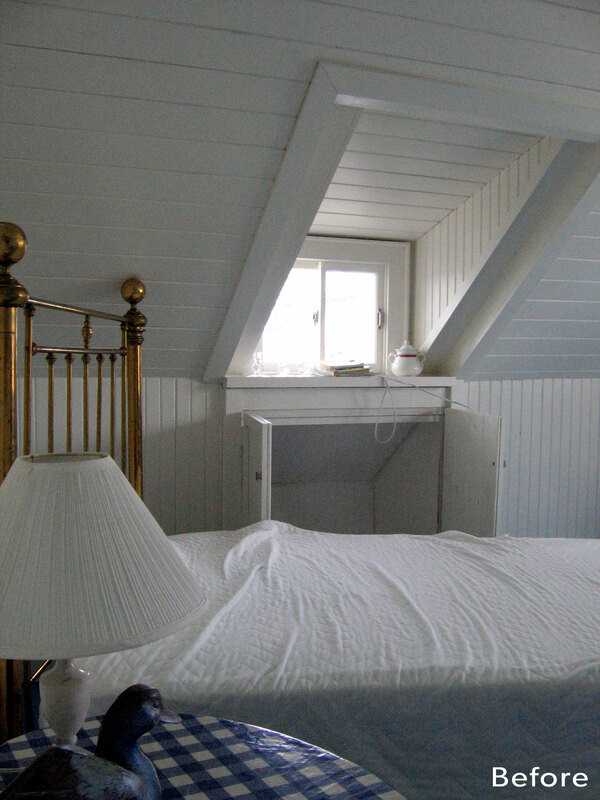 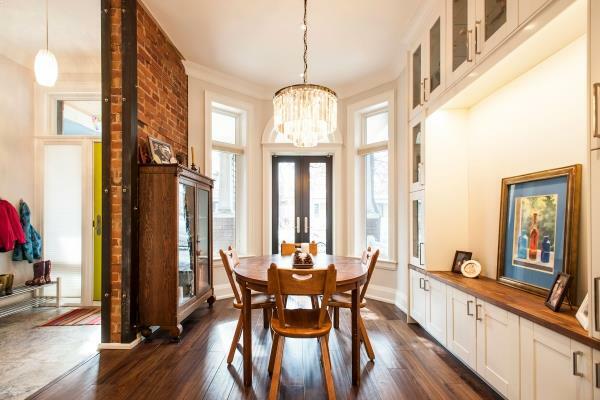 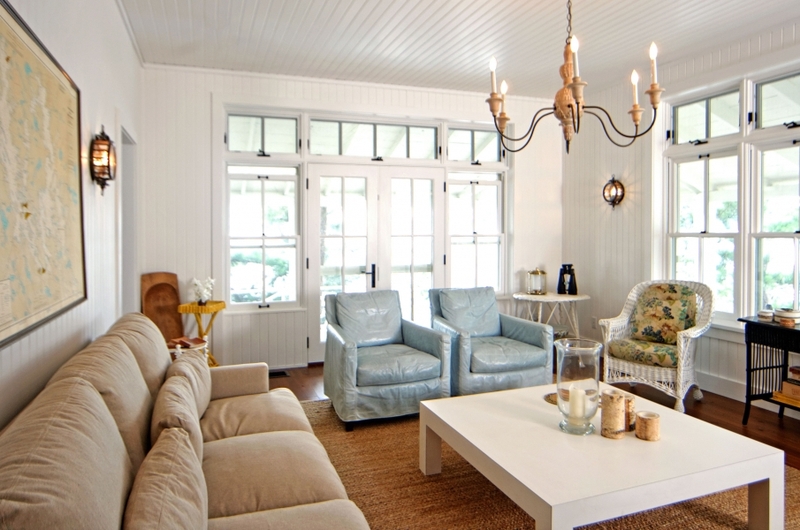 We tried to reuse as much of the home’s original material as possible, to maintain its unique look and charm. 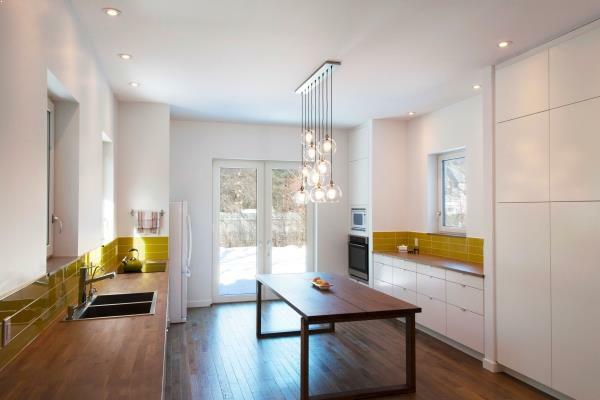 Our general contractor Tamarack North was included early in the design process and provided a wealth of experience and design advice. 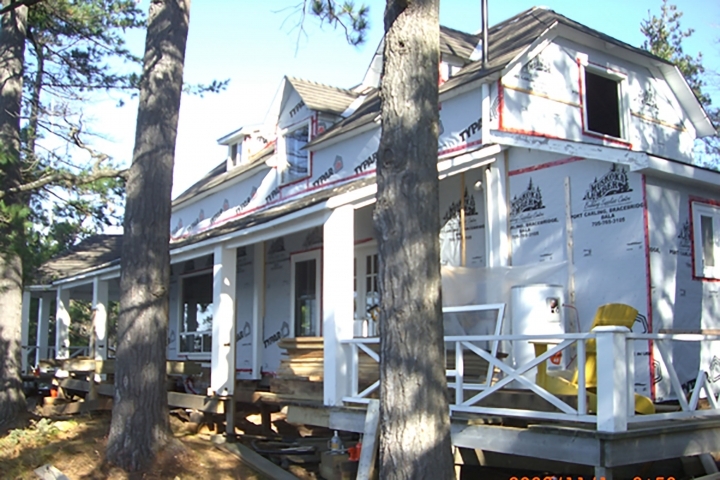 Their site supervisor, John Ritchie, provided excellent craftsmanship while managing the complex logistics that come with working on an island. 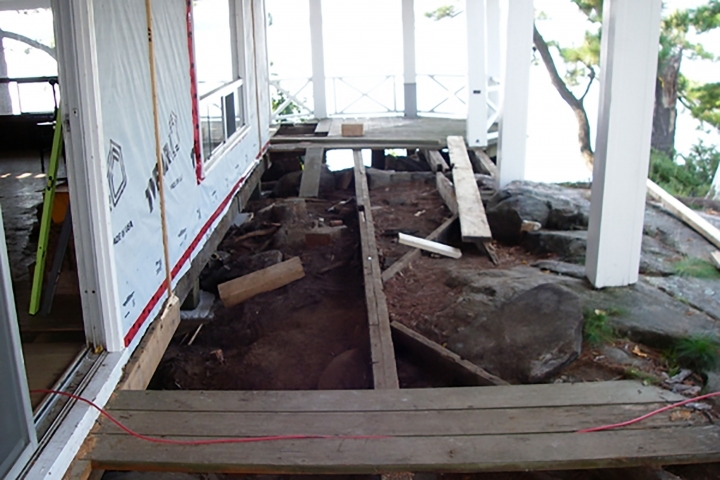 On removal of all the original finishes, many of the foundation posts were discovered to be rotten or structurally inadequate; some of them even appeared to be a piece of firewood turned on end. 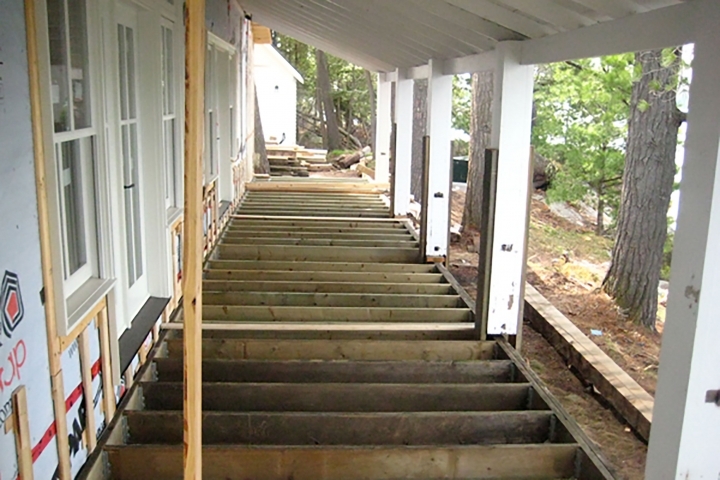 The building team painstakingly replaced all the faulty structures in the floors, walls and roof. They were even able to straighten the main wall, which was visibly bowed outward as a result of the prevailing winds, by using a system of block and tackles set into anchors in the bedrock. Where faulty floor, walls and roof elements were replaced, other parts of the structure were simply rehabilitated. 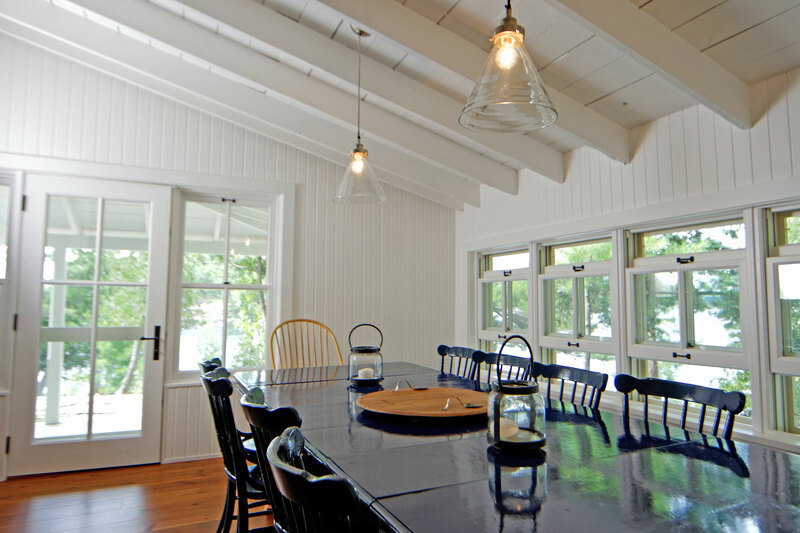 The porch roof was refinished, rafters were left exposed in the dining room, and the original floor above the kitchen was exposed. 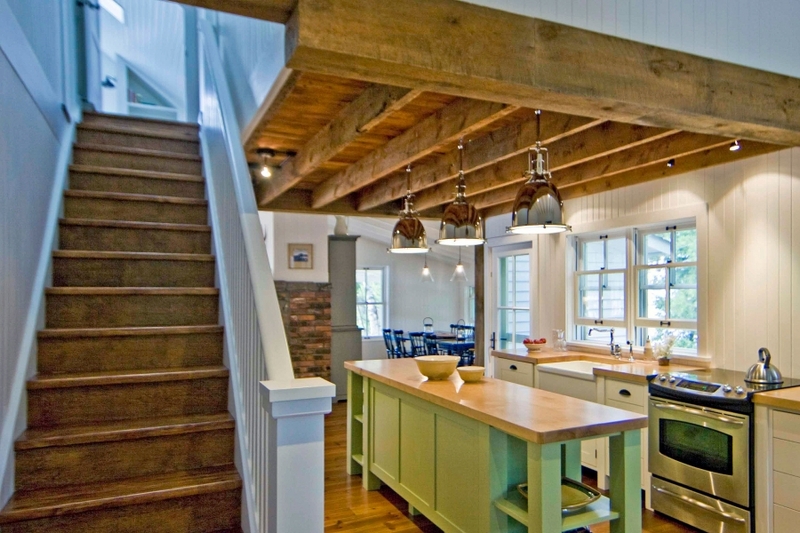 In the dining room and kitchen, the newly exposed ceiling structure adds wonderful texture and creates the appearance of height in the otherwise low spaces. The walls were insulated with spray-applied polyurethane foam, which easily filled the irregular and shallow spaces between the studs and provided additional lateral support. 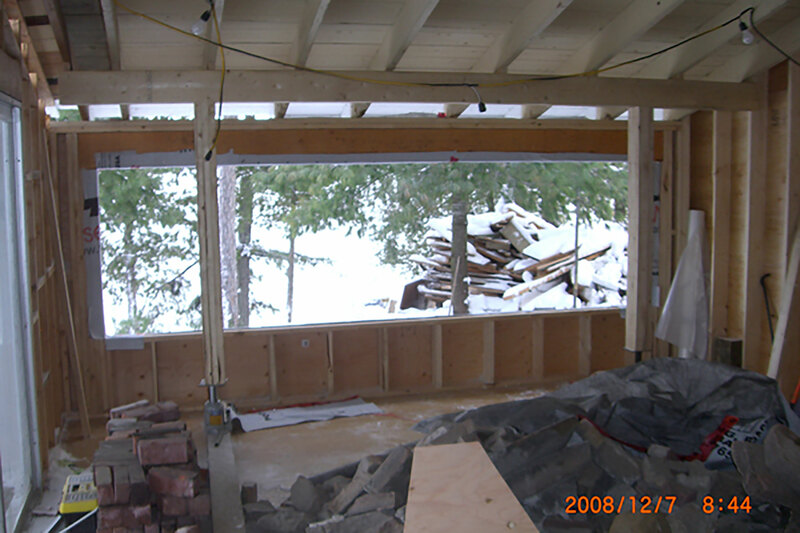 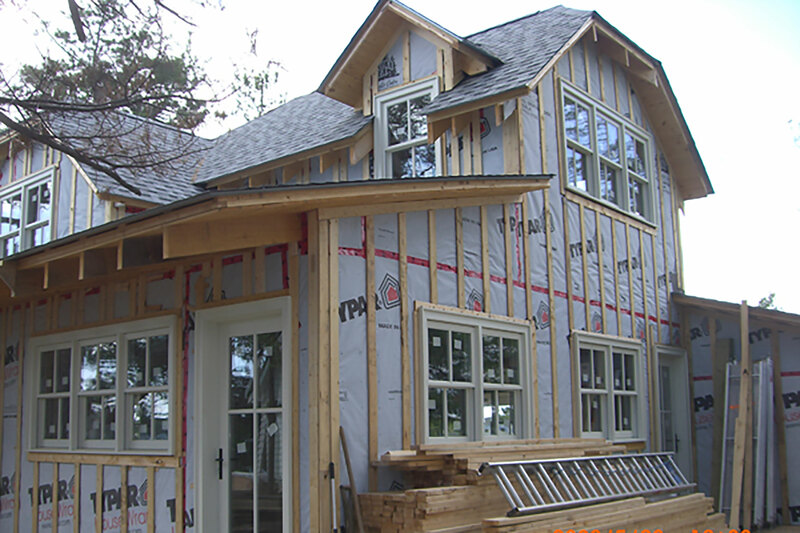 Unlike the majority of homes, drywall was not used to finish the interiors because it would be degraded by the freeze/thaw action when uninhabited through winter. 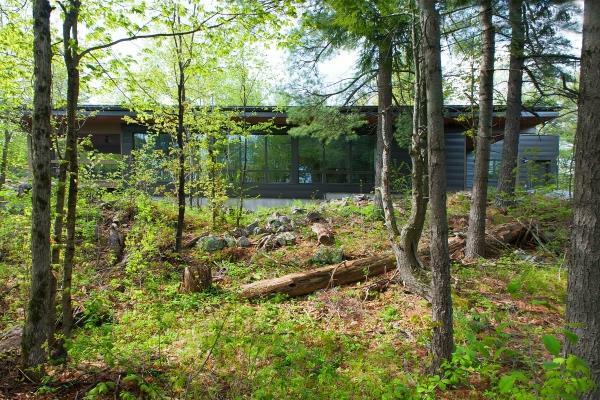 Instead, a premium clear-stained wood siding – custom milled in the Ottawa Valley – was used throughout the house. 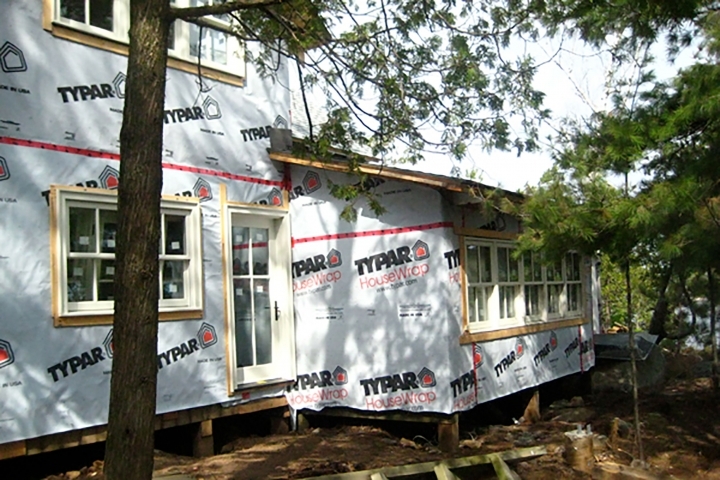 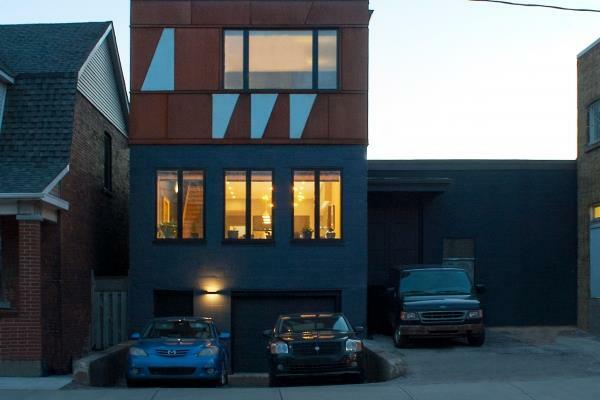 Combined with the existing materials, the siding helped create the vintage aesthetic we were striving for. 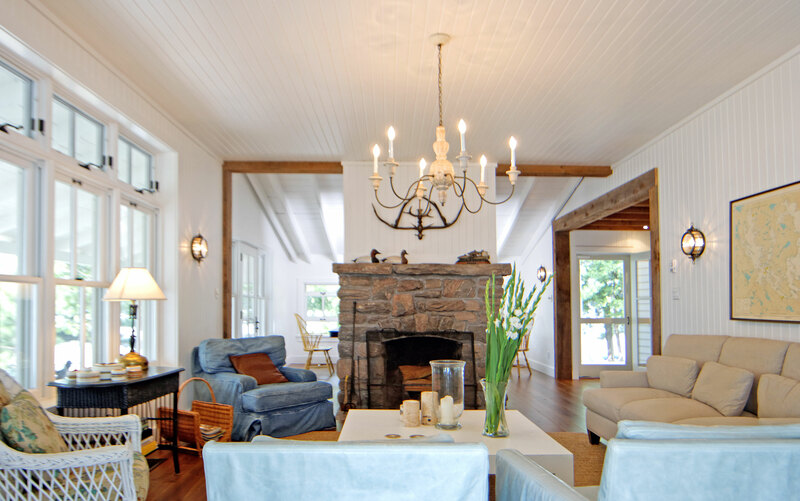 The finished result is a beautiful cottage harmoniously nestled in the island’s small acreage that easily accommodates the residents’ large extended family and numerous guests.